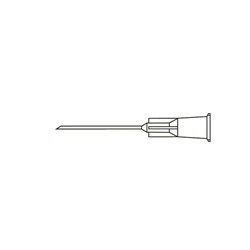 The AccuSurgical disposable Non Atkinson Peribulbar Needle has a straight shaft and needle tip. Available between 23 to 30 gauge and 16mm to 25mm in overall length. Sold 10 per box. 25 gauge. Overall length: 25mm. 27 gauge. Overall length: 16mm. 30 gauge. Overall length: 16mm.